When cooking or baking, there are times when a recipe will need to be reduced or multiplied. 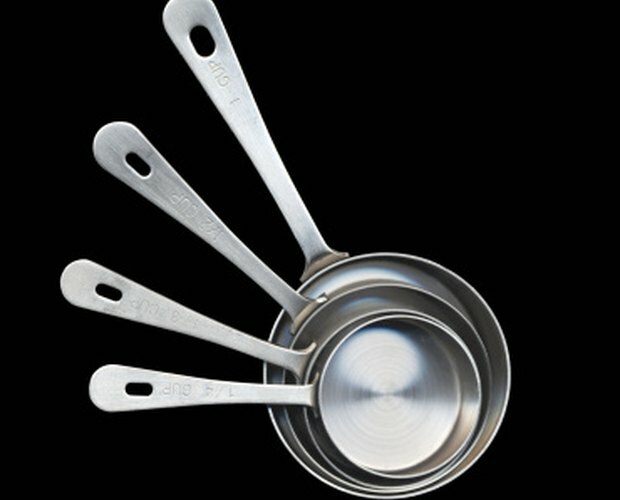 Standard American measuring cups come in 1 cup, 1/2 cup, 1/3 cup and 1/4 cup sizes. Occasionally, a 1/8 cup measure will be included. 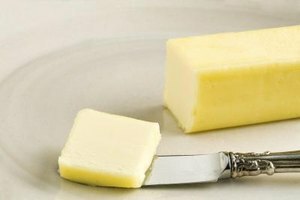 When altering a recipe, the addition and subtraction of fractions is necessary for correct measurements. 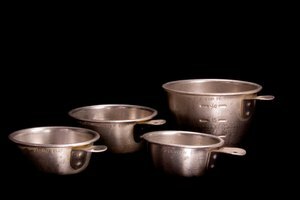 Some measuring cups and recipes will supply measurements in the form of ounces. Basic addition and subtraction is used to add and subtract ounces. Set up the fractions for addition or subtraction. For example, if you want to double a recipe that calls for 1/3 cup, you will need to add 1/3+1/3. Find the common denominator (bottom number) of the fraction. Both bottom numbers are 3 in the example, so the common denominator is 3. Add or subtract the numerators (top numbers) to find the sum. When using the example, adding the numerators will be 1+1=2. Place the common denominator on the bottom of the fraction, and the numerator on the top of the fraction. Therefore, you will need 2/3 cups (1/3+1/3=2/3). Adding or Subtracting Fractions with Different Denominators for Measurements. Set up the fractions for addition or subtraction. 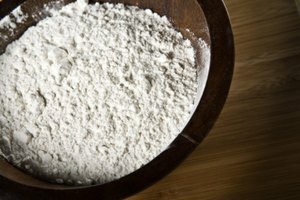 As an example, if you need 1/2 cup for four servings, and 1/4 cup for two servings, to have six servings, you will need 1/2+1/4. Find the least common denominator, which in this example is 4. You arrive at this number by using prime factorization; 2=2 and 4=2x2, which leaves 4 as the least common denominator. Rewrite the fraction with the new multiples, 2/4+1/4. Add or subtract the numerators to find the sum, 2+1=3. Place the common denominator on the bottom of the fraction, and the numerator on the top of the fraction, therefore, 2/4+1/4=3/4. So, this means that for 6 servings, you will need 3/4 cup. 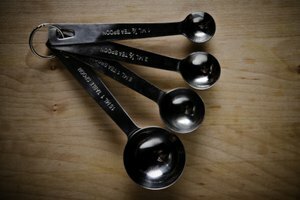 Use the ounce equivalent of the cup measures for altering measurements if a recipe calls for ounce measurements. 1 cup is 8 oz., 1/2 cup is 4 oz. and 1/4 cup is 2 oz. Convert the cup measurements into ounces if necessary. For example, 1 cup equals 8 oz., and 1/2 cup equals 4 oz. 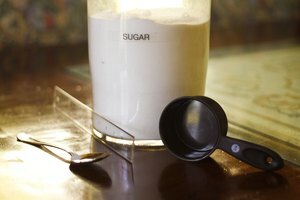 Add or subtract the ounce measurements when altering ingredient amounts. For example, 8 oz. plus 4 oz. (8+4=12) equals 12 oz. Diana Nolen has been a published writer since 2006, with collaborated work published in a "Media Planet" newspaper insert, Tiffin University's "Dragon's Droppings" newspaper, and the "Clearfork Chronicles" newsletter. Nolen is a graduate of Tiffin University with an Associate of Arts in General Arts, and is completing a Bachelor of Professional Studies, also at Tiffin University.